If you haven’t checked out the great set of tutorials from Shelly Cadora and team on the Telemetry page of xrdocs: https://xrdocs.github.io/telemetry/tutorials, it’s time to dive in. Streaming Telemetry in principle is tied to our need to evolve network device monitoring, above and beyond the capabilities that SNMP can provide. 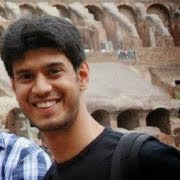 The running theme through the above set of blogs is clear: We need a consistent, model-driven method of exposing operational data from Network devices (read Yang Models: Openconfig, Vendor specific, and IETF) and PUSH the data over industry accepted transport protocols like GRPC or plain TCP/UDP to external Telemetry receivers. This is where IOS-XR really excels. The move from pull (SNMP style) to a push-based model for gathering Telemetry data is crucial to understand. It allows operational data to be collected at higher rates and higher scale (been shown and tested to be nearly 100x more effective than SNMP). Consequently, there is greater focus on tools that can help consume this large amount of data off-box. There are a variety of tools (opensource and otherwise) available for big data consumption: Apache Kafka, Prometheus, influxDB stack, SignalFX etc. A tool we recently open-sourced in this space with complete support for Model Driven Telemetry on IOS-XR (6.0.1+) that, as the name suggests, serves as a pipe/conduit between IOS-XR (over TCP, UDP or GRPC) on the input side and a whole host of tools (Kafka, influxDB, prometheus etc.) on the output side is called Pipeline. You can find it on Github. Find more about it here and here. There is no one-size-fits-all technique for monitoring and managing network devices. There are a lot of network operators that will follow the typical approach: Set up the Model Driven Telemetry on IOS-XR and stream operational data to an external receiver or set of receivers. This is shown below. Pipeline as mentioned earlier, is used as a conduit to a set of tools like Kafka,prometheus etc. However, quite a few of our users have come and asked us if it’s possible to have a telemetry receiver run on the router inside a container (lxc or docker) so that applications running locally inside the container can take actions based on Telemetry data. background in devops engineering is often important to understand how to scale out these services and process large amounts of data coming from all routers at the same time. The alerts or the remediation actions that a user intends to perform based on the Telemetry data received may be fairly simplistic and can be done on box. Bear in mind that running onbox does come with its own concerns. Network devices typically have limited compute capacity (CPU/RAM) and limited disk capacity. While CPU/RAM isolation can be achieved using Containers on box, managing the disk space on each individual router does require special care when dealing with Streaming Telemetry applications. In this tutorial, we look at using a Docker container to host Pipeline and Kafka (with zookeper) as a Telemetry receiver. Further a simple Kafka consumer is written in python to interact with Kafka and take some sample action on a Telemetry data point. In IOS-XR 6.2.1 (before 6.3.1) only global-vrf is supported in the linux kernel. The docker container is launched with the global-vrf network namespace mounted inside the container. 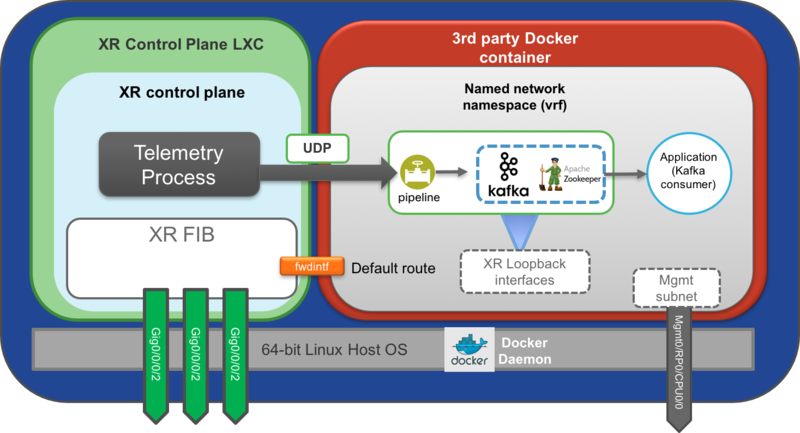 The pipeline and kafka instances are launched inside the global-vrf network namespace and listen on all visible XR IP addresses in the kernel (Data ports in global-vrf, Management port in Global-vrf, loopback interfaces in global-vrf). The ports and listening IP selected by pipeline can be changed by the user during docker bringup itself by mounting a custom pipeline.conf (shown in subsequent sections). Destination address = listening IP address (some local XR IP) for pipeline. On ASR9k, the setup is the same from the user perspective. 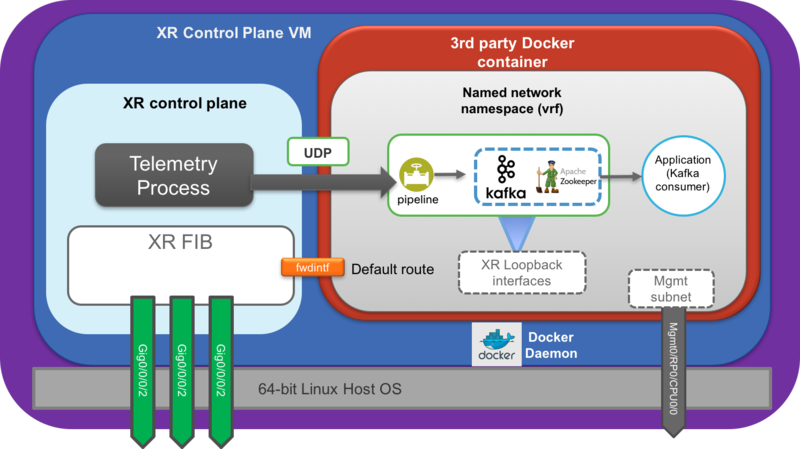 But for accuracy, the Docker daemon runs inside the XR VM in this case, as is shown below. It is recommended to host onbox daemons (in this case Kafka, pipeline, zookeeper) on either the all IP address (0.0.0.0) or on XR loopback IP addresses. This makes sure that these daemons stay up and available even when a physical interface goes down. We will utilize this image and build our own custom variant to run on an IOS-XR box for onbox telemetry. To build our own Docker image, you need a development environment with Docker engine installed. we use –recursive to make sure all the submodules get pulled as well. The submodules are actual github repos for the standalone pipeline and docker-kafka projects. remote: Counting objects: 14615, done. remote: Compressing objects: 100% (8021/8021), done. Receiving objects: 100% (14615/14615), 43.97 MiB | 2.02 MiB/s, done. Resolving deltas: 100% (4012/4012), done. remote: Counting objects: 98, done. ENV vrf_exec "ip netns exec $vrf"
We setup the script to accept arguments from the user during build time. This will allow us to be flexible in specifying the vrf (network namespace) to spin up the daemons in, in the future. Today in 6.2.1 (before 6.3.1), only global-vrf is supported. In Dockerfiles, the ARG variables are rejected in the ENTRYPOINT or CMD instructions. So we set up an ENV variable (which is honored) to create a command prefix necessary to execute a command in a given network namespace (vrf). We place the sample application (in this case written in python) inside the image to act as a consumer of the Telemetry data pushed to Kafka. This application can contain custom triggers to initiate alerts or other actions. For this tutorial, we will initiate the script manually post launch of the container. The user can choose to start the application by default as part of the ENTRYPOINT or CMD instructions in the dockerfile. This specifies the command that will be run inside the container post boot. The first part of the command $vrf_exec echo "127.0.0.1 localhost" >> /etc/hosts sets up /etc/hosts with an entry for localhost making it easier for kafka and applications to talk to each other locally. The second part of the command $vrf_exec supervisord -n is used to start all the services in the correct vrf (hence the $vrf_exec). [email protected]:~/pipeline-kafka/iosxr_dockerfile$ sudo docker build -t pipeline-kafka-xr . Step 4/6 : ENV vrf_exec "ip netns exec $vrf"
The name of the image may be different based on the “docker pull” technique you use. Before we spin up the container, let’s create a custom pipeline.conf file. This is important because the docker daemon runs on the underlying host layer in case of NCS5500/NCS5000/XRv9k and Vagrant IOS-XR platforms. /misc/app_host is a shared volume between the host layer and the XR LXC in these platforms. As for ASR9k, there is no issue placing the file anywhere since docker daemon runs inside the XR VM itself. But for consistency we’ll stick to the /misc/app_host location. Finally, launch the docker container by mounting /misc/app_host/pipeline.conf to /data/pipeline.conf inside the container where it will be picked up by the pipeline process. [email protected]:/# ps -ef | grep -E "pipeline|kafka|zookeeper"
Perfect! As we can see the required services: Pipeline, Kafka and Zookeeper were started in the correct network namespace ( notice we did an exec into the global-vrf network namespace) before checking if the processes are running. We select the following sensor path: Cisco-IOS-XR-infra-statsd-oper:infra-statistics/interfaces/interface/latest/generic-counters. This sensor path is used to export interface stats for all interfaces on the box using the Cisco IOS-XR infra-statsd-oper YANG model. As soon as you configure Model-Driven Telemetry as shown above, the router will start streaming statistics to the local pipeline instance. Pipeline will then push the stats to Kafka running locally to the topic = ‘telemetry’ ( We configured this in our custom pipeline.conf file). Finally purely for test purposes, the docker build process includes a sample python script that uses the python-kafka library to act as a kafka consumer. print "\nTelemetry data Received:\n "
Works Great! Now that you’re able to capture Telemetry messages in realtime through a python script and are able to parse through the fields, you should be able to create your own conditions and actions based on the value of the fields. There you have it! Your own standalone pipeline and Kafka based Telemetry receiver running on the box.